We are committed to making crossword creation easy and enjoyable. All of the features you would expect are there: the ability to automatically or manually add words to your puzzle, save-as-you-go puzzle editing, the ability to access your puzzles from any computer, and more. Our interface is uncluttered and easy to use, and we pledge never to show you ads. What will my puzzle look like? The puzzle that generated this printout is this circle vocab crossword. You don’t need to do anything special to get the print layout different from the screen layout, that’s handled automatically. Plans cost a few dollars per month. Click the green 'Make Printable' button at the top left of your puzzle when you are ready to choose a plan, or visit your “My Account” page. Individual puzzles can also be purchased for special events. Once you have a plan, the 'Preview + Publish' button on the top left of the screen where you make your puzzle lets you put your puzzle in a format that can be printed or solved online. Once you “publish” your puzzle, you can click the print icon or use your browser’s print function. Can I print from a different computer? Yes. For example, a teacher may create a puzzle on her home computer or iPad and print it the next day from a school computer. All puzzles you create are automatically saved to your account as you work on them, and you can always get to in-progress or completed puzzles on your 'My Puzzles' screen when you log into your account. If this teacher is out sick, she can even email the link for her completed puzzle to a substitute and the substitute can print it, without needing to log in or have an account. Do you offer word searches? Check out the word search maker at our sister site, MyWordSearch.com. You can also buy a joint subscription to both sites for a 20% discount when you sign up for a plan. Can I save to my computer? Yes. You are able to save it as a PDF (the icon is next to the print icon). However, most people find it easier to log in and print when needed (the puzzle is saved on your account), or share the puzzle by emailing the link to the puzzle. Teachers: Crosswords are easy to grade, and students love them. Your students are motivated to solve the puzzle, and enjoy thinking about the concepts and vocabulary necessary for the answers. How many other quizzes are your students excited to take? Trainers: It is important to verify that your class understood the material covered, but a standard assessment quiz can be boring. 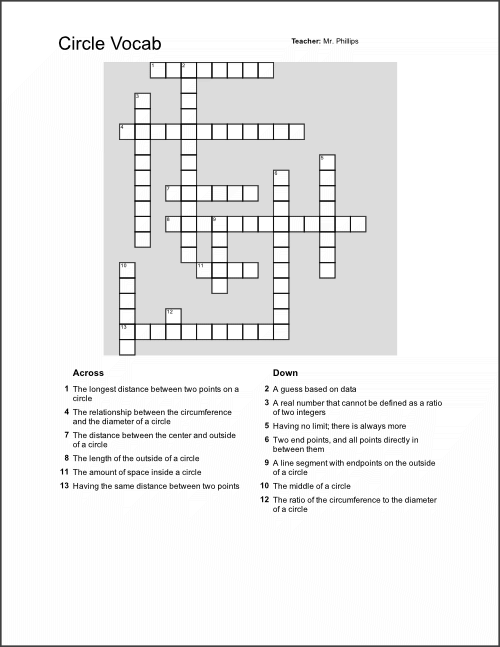 Use a crossword to keep things fun and interesting for your class. Personal: Creating a crossword puzzle for someone is a great gift  both fun and meaningful. Great for birthdays, weddings, anniversaries, Mother’s Day, Father’s Day, Valentine’s Day, or “just because”. Your account is needed to access your in-progress and completed puzzles, and to ensure you can always publish your puzzles when you’re a paid user. Additionally, our save-as-you-go puzzle creation tool relies on saving to your account, so you can resume your puzzle in case of computer issues. Where are my saved puzzles? When logged in, click on the 'My Puzzles' link in the header to see your saved puzzles. Puzzles you are working on can be found in the “Crosswords I’m Making” section, and puzzles you’ve completed can be found in the “Crosswords I’ve Published” section. How do I add a “down” word? After clicking on your grid, press spacebar or click on the active square to switch typing direction. How do I buy in bulk for my school or organization? Are there discounts for group purchases? If you are making a purchase for more than 5 people, please email [email protected] and provide the name of your organization and the number of people for whom you are making a purchase, and we will send you the applicable discount and provide next steps. Can I buy subscriptions to Crossword Hobbyist in bulk and resell them? Please contact [email protected] for reseller terms and conditions. Do I own the puzzles I make? Yes. The puzzles you make are 100% yours, and belong to you. They won’t be used or sold by Crossword Hobbyist. For each puzzle you publish, you have the option for it to be publicly visible or password-protected. Bloggers get free access to Crossword Hobbyist. To get blogger access, email [email protected] and include a link to your blog for approval. Can I embed puzzles in my website? Yes. Puzzles you create and publish on Crossword Hobbyist can be embedded and solved on YOUR site. Here are some super-easy instructions to embed a crossword in your site. What are your terms, conditions, and policies? You can use the gray “Report an Issue” button at the top of every screen. If you’re a paying customer, you have a right to be satisfied. And so while many companies make reporting issues difficult, we make it easy. If there’s something we could be doing better, we want to know. And if you like Crossword Hobbyist, we wouldn’t mind hearing that, too.